Have you ever wandered off the beaten path and driven down a lonely dirt road just to see where it ends? Taking time to explore is always a top priority on our trips, and it is never time wasted. Sometimes what we find is an explorers pot of gold, and other times it’s a gate with a No Trespassing sign. But it’s always an adventure. In 1996, while exploring the backcountry of the Chiricahua Mountains we came across to markers that said simply Unknown Arizona Pioneers. Later research on this site revealed quite a story about the Apache War legends surrounding these gravesites. 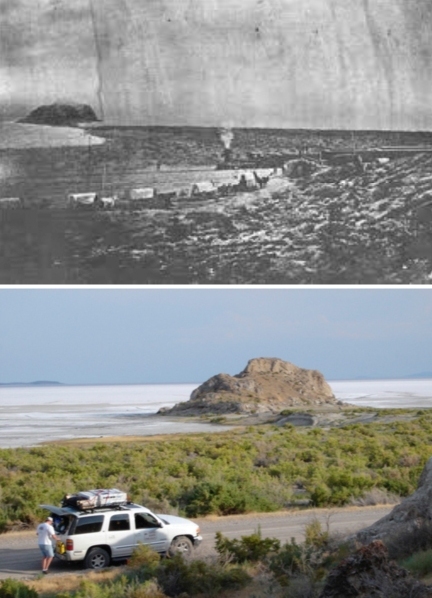 On another trip in 2003, we drove the old transcontinental railroad grade, abandoned in the 1940’s, across the western half of northern Utah, only to breakdown on the same spot as the historic 1869 photo of the last eastbound wagon train meeting the first westbound train. We had punctured our tire with a 134 year old rusty railroad spike. Three ghost towns and miles of history later, we came out in the town of Wendover, NV. One that sticks in my mind was this old water trough, built of hand-hewn lumber, with the spring still bubbling at the far end. Lots of antelope that day, but the rancher and his cattle had left this lonely place long ago. One place that we consider very special is a remote mesa at the end of a rough road in central Arizona. The density of rock art and petroglyphs on this mesa are quite impressive, and only in recent years have archeologists begun to study this area. This must be one of the least disturbed ancient-man sites in Arizona, and it was only our curious minds that led us there. 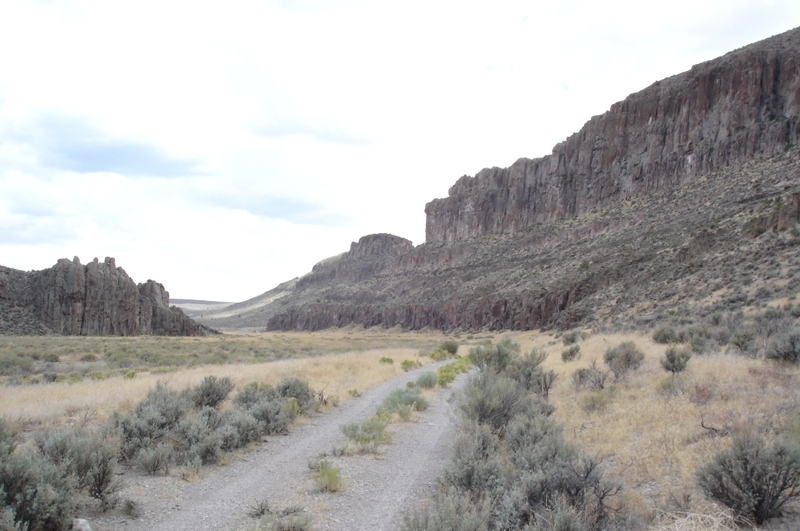 No signs or maps exist for this historic and remote area. On a recent trip through Nevada, we drove a dirt road that led through the old Osceola Mining District, where mining headframes seemed to reach for the sky, and the buildings appeared as if the the miners just up and left one day, and never came back. Each of these adventures, and others too numerous to list here, were all the result of driving down an un-mapped dirt road, just to see where it led and what we might find. Oftentimes the drive was fruitless, but on others we found memories to last a lifetime. And we have camped in some remote and incredible locations. And there are many more dirt roads yet to follow. Leaving time for the unexpected is important, and is the part of the journey I often anticipate most. Whether is it fixing a flat tire in the middle of no-where, or finding amazing displays of ancient rock art, the adventure never disappoints. Take the next dirt road you pass, drive along for awhile and see what’s around the next corner. Hoping everyone has a great summer of camping adventures! Who doesn’t like kabobs? We’re in full camping swing now and it’s high time we get into some grilling action. And kabobs are just plain fun. The key to making these special is in the marinade. Of course there are countless marinades you can do. You can play mad scientist and come up with all manner of concoctions. The idea here is to have fun with it and experiment. First we’ll start with the marinade. Combine the yogurt, lemon juice, olive oil, salt and pepper, garlic, and rosemary in a medium mixing bole and whisk thoroughly. Add beef cubes to a gallon-size zip-top bag and pour in the marinade. Push out as much of the air as you can and seal the bag. Massage contents gently to make sure every piece is coated. Store in the refrigerator or icebox for at least 3 hours and up to 12. Also, soak the skewers in water at the same time, for a good 3 hours. I don’t like handling raw meat at the campsite so I prefer to assemble these at home and transport them in disposable aluminum baking pans covered with foil. There’s nothing worse than setting up camp and realizing you forgot some crucial items back at home. Use our camping checklist to make sure you have the necessary camping equipment to make your camping experience a good one. Print this handy list to make sure your next outing is a good one! 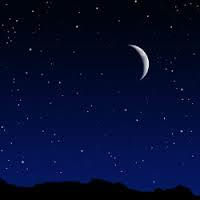 There are few things more enjoyable during a night in camp than staring at the night sky. Now you can be a celestial expert and dazzle your camp mates with your night sky knowledge. There’s lots going in this May so grab your telescope and your tent and get out there! May 10 – Astronomy Day Part 1. Astronomy Day is an annual event intended to provide a means of interaction between the general public and various astronomy enthusiasts, groups and professionals. The theme of Astronomy Day is “Bringing Astronomy to the People,” and on this day astronomy and stargazing clubs and other organizations around the world will plan special events. You can find out about special local events by contacting your local astronomy club or planetarium. May 24 – Possible Meteor Storm. In the early morning hours of Saturday, May 24, the Earth will pass through the debris field left behind by a small comet known as P/209 LINEAR. Astronomers are predicting that this interaction may result in a brief but intense burst of meteor activity that could range from dozens to hundreds of meteors per hour. Nothing is certain, but many mathematical models are predicting that this could be the most intense meteor shower in more than a decade. Share your favorite camping photo with your PahaQue tent on our page, and you will be entered to win a brand new PahaQue Single Hammock! Your choice of color (navy/light blue, or green/khaki). 1. Enter as many times as you would like. 3. This contest is not administered by Facebook. 4. Contest ends Friday June 6 at which time we will announce three winners on our Facebook page.